Two brothers accused of killing a father-of-four while he shopped for gifts at a Hayward Target on Christmas Eve claim to have stabbed him in an act of self-defense, according to their sister. The suspects, identified as 22-year-old Frankie Archuleta and 25-year-old Jesse Archuleta, allegedly told their sister that Tyrone Griffin Jr. threatened them, saying that he “plays with guns.” He apparently called friends to get involved in an altercation over a request that the Archuleta siblings turn down vulgar music that they were playing in the store’s toy section. It remains unclear where Griffin Jr.’s friends were as well as how and when he contacted them. The woman, who asked to not be named, also said that one of her brothers got hit in the face with a bottle and blacked out. She did not specify which one of the men was hurt. She did say, however, that she hopes Target’s surveillance video will prove their innocence. The Archuleta brothers didn’t go out looking for trouble. Like Griffin Jr., they too were searching for last-minute gifts, their sister stressed. But Griffin Jr.’s wife Nicole Simmons disagreed. "It was two against one," she said. "They had a knife; he had my son." The Archuletas’ relatives flocked to a courtroom for the suspects' arraignment on Wednesday, at which time they said they cannot afford private attorneys. They are due back in court on Thursday and will be appointed public defenders. Simmons was also in court. Simmons also expressed sadness and shock over the death of her husband and father of her children. A witness told NBC Bay Area that Griffin Jr. had asked the suspects to turn down what he considered inappropriate music while shopping with his four-year-old son at the Whipple Road Target where he was buying one last-minute gift. The witness said he saw Griffin Jr. put one of the men in a headlock, but was punched or stabbed repeatedly by his brother. When Griffin Jr. lifted up his shirt, the witness said he was bleeding badly. The victim then crossed into the food aisle and went into shock in front of his child, he said. When police arrived at the store, they helped take the father-of-four to Eden Medical Center, where he was pronounced dead. 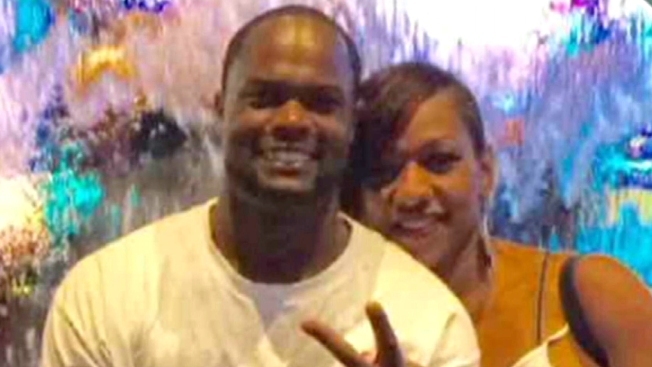 Griffin Jr.'s wife Nicole Simmons set up a GoFundMe page on Tuesday. The goal amount on Tuesday was $8,000. By Wednesday, that number had been bumped up to $45,000 as 482 people had helped raise over $21,000. She wrote: "Words can't describe the pain I feel inside. My heart continues to beat but I don't feel alive. My children wake up on Christmas Day. But their father was killed the night before and I don't know what to say. How do I explain to my children that their father will no longer be coming home." According to Simmons, one of the couple's children, Josh, had more presents than his sister Jade — a situation that Griffin Jr. set out to rectify. Simmons said Griffin Jr. had promised her that this would be "the greatest Christmas ever." To that end, he spent hours putting up the family's Christmas tree, setting up a train set, hanging lights and decorating the house. "I think at times he was more excited than the kids," Simmons wrote. "Who would have ever thought these last minute gifts would cost him his life. What type of person would take a life in front of a child. My children are fatherless because of a thoughtless act of rage. Something that could have been totally avoided just by walking away." The stabbing was Hayward's 13th homicide of the year.